Like a rainbow in the dark, the new Root Industries Radiant wheels are sure to shine bright in the world of freestyle scootering. Crafted with the same high level of care and quality as the rest of the Root Industries lineup, Radiant wheels will impress any rider - beginner, all the way to professional level. Radiant wheels are made in the same fashion as standard AIR wheels, but with a gorgeous, vibrant urethane color. Yellow, blue, green, or orange - there’s no wrong choice. 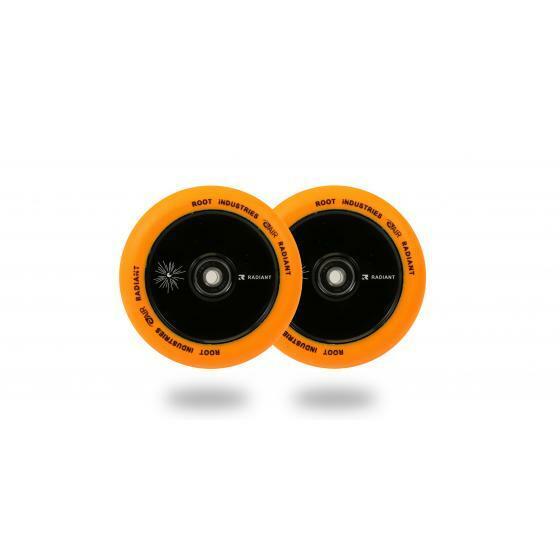 Tested by top riders in the industry, the Radiant wheel has proven time and time again to be just as durable and smooth as any Root Industries wheel. Any scooter rider can stand out in style with the new Root Industries Radiant wheels!